Includes: A seat protector to protect your car's seat from the wheels of the Car Seat. The award winning Cuddleco Doona Group 0+ Car Seat - Storm is a revolutionary travel system. Perfect for parents on the go, this car seat with integrated wheels converts to a stroller at just the touch of a button. The Doona surpasses every safety standard both as a car seat and as a stroller. The Cuddleco Doona Group 0+ Car Seat - Storm incorporates deep double walled side impact protection and anti-rebound technology, keeping your little one safe and secure. The inner cushioning made from bamboo charcoal fibre is both anti-bacterial and hypoallergenic, and provides humidity and thermal regulation for your baby’s comfort. As a stroller, the suspension guarantees your little one has a smooth ride, and it only takes one touch to brake. 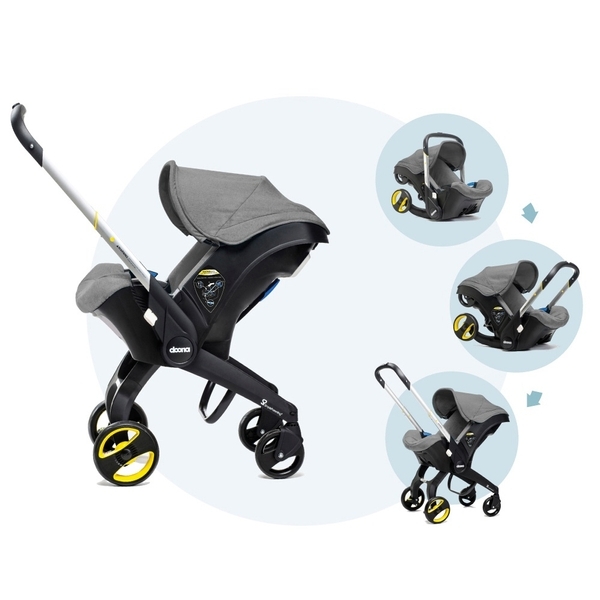 The Easy Instant Fold even ensures compact storage—so it’s not just boot room you’re saving by not having to carry a separate stroller or travel system. Easily secured using your 3 point seat belt, the Cuddleco Doona Group 0+ Car Seat - Storm can als be installed with a Doona ISOFIX base (Ref: 140493), sold separately, for added safety and convenience. Also compatible with the Doona Rain Cover (Ref: 140484), sold separately. The Doona includes a seat protector to protect your car's seat from the integrated wheels of the car seat. EU Warning: Always secure the Doona Car Seat onto the vehicle seat in a rearward-facing position. Never fit a rearward-facing baby seat in the front if there is an airbag on the passenger side of the car.